Samsung promised something ‘unprecedented‘ and revolutionary at CES 2013, and boy have they delivered, releasing an 85-inch 4k floating design TV. 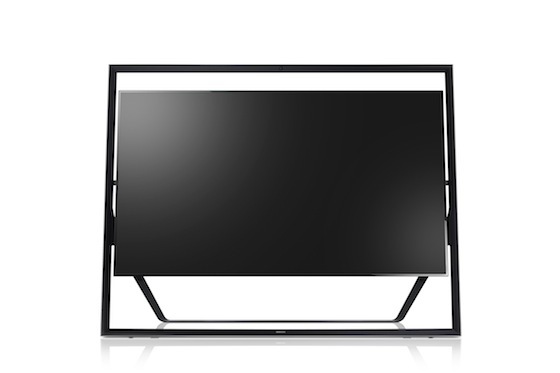 The Samsung 85-inch UN85S9 is the world’s largest Ultra High-Definition TV and is suspended by a metal frame that can be titled up or down. Oh, and it’s not just a frame, it is also a 120-watt 2.2 speaker system! Whilst you’ll have to have a pretty big living room to fit this massive TV in, it sure does look nice. This is currently the worlds biggest 4k TV, on the worlds smallest bezel for a Ultra-HD TV, with a design we have not seen yet. Samsung, unfortunately, have revealed that they wont be providing any native 4k resolution content, which means that we’ll have to rely on content providers to deliver the 4k goodness to us, reinforcing a point I made originally when Samsung announced something ‘revolutionary’; whilst it’s great this is the direction manufacturers are going and it looks incredible, without much content you have to question the usefulness of one of these 4k TV’s in the current world. The TV features features Samsung’s new Smart Hub software, S-Recommendation, and voice control, all powered by a 1.35Ghz quad-core A15 processor, built into the TV set and surrounding frame. It also has a set of locally dimmed LED-backlights which helps with black levels and contrast performance. The standard HDMI ports are available, 4 to be exact as well as optical audio output. Samsung have yet to release any pricing information for the set, but it is set to land in March 2013, so you best get saving! Samsung is also promising a a 95 inch and even a 110 inch model before 2013 ends, as if 85 wasn’t already big enough. With the trend we are seeing with 4k TV’s, you do begin to ask yourself, is bigger always better?